Protein Aggregation StateAF4 is a breakthrough technology for the separation of polymers, nanoparticles, proteins and other biomolecules without the need for a chromatographic column. This versatile technology uses an unpacked separation channel and differential flow to separate molecules and particles by size. The absence of a stationary phase results in no shear forces and a matrix interaction-free sample separation eliminating analysis artifacts for shear sensitive materials. Elution order is from smallest to largest with a separation range from as low as 1 kDa (1nm) to as high as several MDa (10 µm). 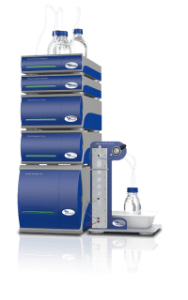 AF4 can be coupled with UV or Multi-Angle Light scattering to obtain concentration and absolute molecular weight information.AF4 is particularly valuable for examining and quantifying protein aggregation state including monomer, dimer, trimer and higher aggregates. The FDA has recently recommended the use of AF4-MALS for characterization of antibody formulations. Draft Guidance for Industry on Immunogenicity-Related Considerations for the Approval of Low Molecular Weight Heparin for NDAs and ANDAs, Food and Drug Administration (FDA), August 2014.